St. Croix Watershed Research Station sediment core, Vadnais Lake 1998, 0-3 cm. 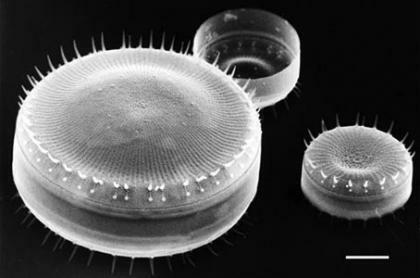 These pictures are of a single species of diatom taken using three different types of microscopy. Diatoms are a group of microscopic algae that have a cell wall made of biologically produced glass. The glass cell wall is what we are seeing in these pictures, or micrographs. Stephanodiscus niagarae was discovered in 1845 and described by the German diatomist Christian Gottfried Ehrenberg from material collected at Niagara Falls. Today this species is still common in many temperate lakes in North America. The two images to the right were taken using a light microscope. Both pictures are of the same specimen; the top image was taken with brightfield illumination and the lower image taken with differential interference contrast to produce the magenta background. This specimen is about 36.5 micrometers, or 0.0365 mm, in diameter, only 0.0014 inches! We found it in a sediment core taken from Vadnais Lake in 1998 during a research project conducted at the Science Museum of Minnesota's St. Croix Watershed Research Station. Vadnais Lake is located north of the Twin Cities in Vadnais Heights and is a source of municipal water for the St. Paul Water Utility. The diatoms in sediment cores were studied to determine the history of nutrient loading (increased amounts of nutrients such as phosphorous and nitrogen) to Vadnais Lake in order to compare the lake's condition before European settlement in the region with today's lake conditions. The picture at the top of the page was taken with a scanning electron microscope, which allows even more detail of the cell wall surface to be seen. The two cells shown are the same species. As diatoms divide they produce smaller and smaller progeny, so that within a collection we often find many different sizes of the same species. The large cell is about 0.056 mm diameter and the small cell only .025 mm diameter. From this image and the ring of spines surrounding each cell, it is clear how this diatom got its name: translated from the Greek, Stephanodiscus means "crown-disc."